Please email comments, queries and suggestions to the WebMaster. 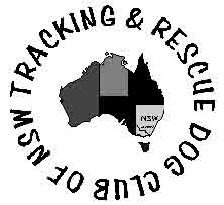 Welcome to the website of the Tracking and Rescue Dog Club of NSW. We only track in winter because of the danger of snakes - here’s some information about our activities. Tracking is getting your dog to follow the scent of one person, ignoring any cross tracks, over a variety of terrain. Tracking can be done for enjoyment, for rescue work and for competition. All dogs can track - from fluffy (and not so fluffy) toy dogs through to Great Danes and Irish Wolfhounds. They all have noses and they all have a scenting capability many times greater than that of humans. What is tracking used for? Humans have been employing the capability of the canine nose for centuries, to track game, lost people, felons, truffles and other interesting items. In Holland the scenting ability of dogs is used in court as evidence. The scenting ability of dogs has been used for centuries to search for lost travellers in Switzerland. In the last century many countries have set up search and rescue teams using dogs to find people lost in rubble or in the wilderness. You can utilise your dog’s scenting ability to track competitively, gaining titles from the Australian National Kennel Control (ANKC) as you become more proficient. Come to one of our training days or workshops and we’ll get you started in this enjoyable activity. Dogs tracking competitively work on a harness and a ten metre tracking lead. You can purchase these items from us - check out our shop. What are these tracking titles? Your and your dog can gain the titles of Tracking Dog (TD), Tracking Dog Excellent (TDX) and Tracking Champion (T Ch) by passing certain Tracking tests, as specified by the ANKC. TD and TDX are listed after your dog’s name - for example Dreyfus Indigo TD, or Bismarck Janus TDX. The Tracking Champion title precedes your dog’s name, for example T Ch Nullarbor Joe. Before you can enter a tracking trial, you must be a member of your state Canine Council, and your dog must be registered with a Canine Council of Australia.